Kaia Gerber is a charming American model, well-known also as the daughter of known around the world supermodel Cindi Crawford. • Kaia was born on September 3, 2001. The girl's mother was already one of the most known models. The father, Randi Gerber, is also the representative of secular elite. He was a model in the past, and now he is the restaurateur, the owner of night clubs, popular in New York. They have a son Presley which also grows in a family. Children from the earliest age were constantly under a sight of cameras of paparazzi. • Cindi Crawford didn't want destiny of model for the beloved daughter. But the girl grew so beautiful and charming that it was difficult to provide her in somewhere in other profession. • Kaia Gerber was born and spent a lot of time in California and of course she gets involved in surfing which is the very beautiful and challenging sport. • Kaia Gerber shootings for advertising of bathing suits were one of the first work in the life of young model. It is interesting that Cindi Crawford didn't like the daughter's debut at all, she counted some pictures a little frank. Famous mother made the decision to suspend her modeling career to Kaia's adulthood. • But in 2012 the charming girl was invited to displays of a children's collection of Donatella Versace. The charming collection carried the name "Young Versace". • Contract signature with the world famous model agency "IMG Models" became the following step in the career of young model. • Over time manifested also artistic talent of Kaia Gerber. Not without reason she participated in theatrical performances at school age. The girl was invited to act in the movie "Sister Cities". The film tells about difficult experiences of sisters which faced this tragedy: the death of their mother. For supporting Kaia all family came to the premiere of the film which took place in solar Los Angeles. 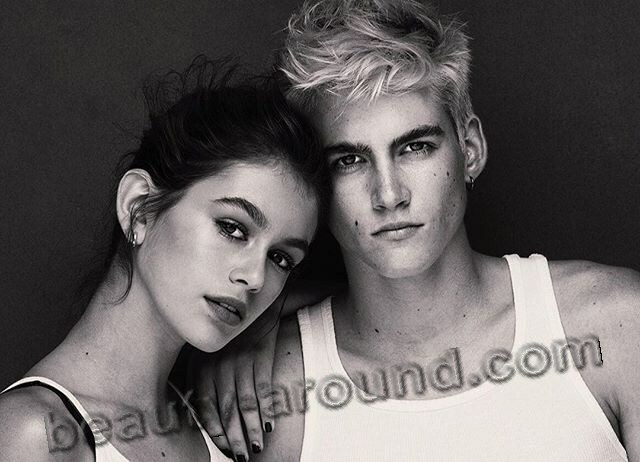 All who worked with the girl, note the fact that Kaia Gerber knows how to apply themselves, she is very much loved by the camera. Both in pictures, and on a podium, and at cinema she is very natural and unique. In 14 years Kaia appeared on a cover of the most important glossy magazine Vogue. Many well-known models, actresses who have more wealth of experience and achievements in career only dream of it. On a cover the young beauty acted together with the mother. Such family duet turned out very charming and effective. Cindi Crawford's family filled up model business by one more outstanding personality. The brother of Kaia also began to participate in displays of design collections.